10″wide x 6″. Click to enlarge. 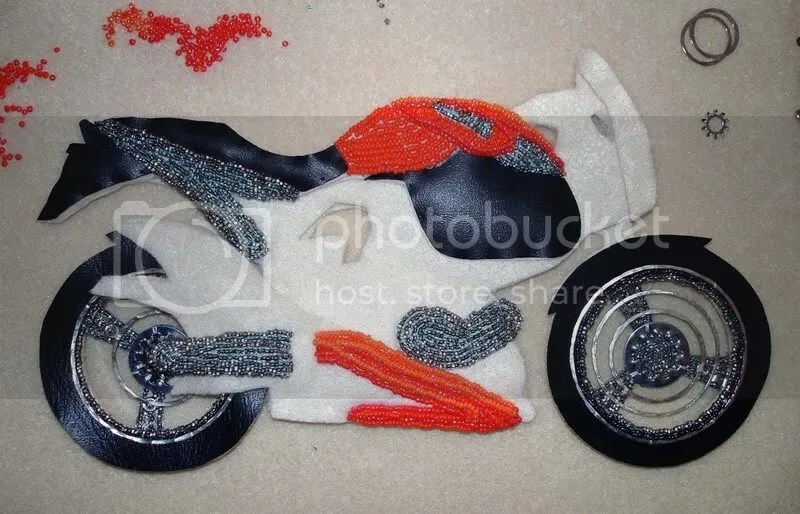 >I love the addition of the orange beads. How fabulous! >Missed some of your recent posts. You’ve done a lot lately. The orange is awesome. It is really coming together. >You never, ever cease to amaze and impress! The orange is perfection. >ooh you’ve done a lot while I’ve been away. Looking hot. >Me like! It totally pops. >Orange is definitely the right colour for this bike 😉 I can’t wait to see it finished! >Wonderful! But you knew that, Right! >I think it looks great! Keep up the good work! >I’ve missed a lot the past couple of weeks after burying my head in my website!This is so cool – I really like the orange and black! >The orange is great! My inclination would have been red – boring and predictable. >Honestly I love it …the orange makes this design come to life…can’t wait to see the finished piece!